Thanks for all the interesting conversation that is still ongoing about the What is the Opposite of Love? poll and post. 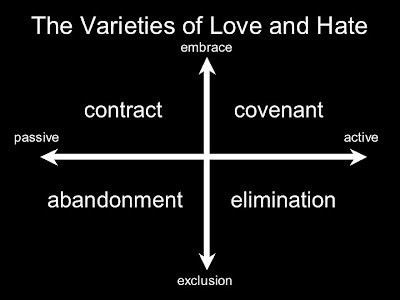 That conversation had me thinking hard about the relationships between love, hate, and apathy. I don't think "apathos" is a word. I just made that up. But basically, if you noticed, I pulled my thinking from my comments in the Opposite of Love post into this diagram. First, there is the "apathy" dimension, where our actions can be intense, engaged, and "hot" (pathos) versus when our actions are cooler, more disengaged, and distant (apathos). The vertical dimension charts our antisocial versus prosocial impulses. This dimension gets at Augustine's incurvatus in se (i.e., antisocial: the self "curved in on itself") as opposed to an excurvatus ex se (i.e., prosocial: a self curved outward). Thus we have cold froms of hate like apartheid, segregation, and abandonment. This is the hate Chris was referring to (I think). Similarly, there are hotter forms of hate like genocide, hate crimes, and malicioius violence. This was the hate I was talking about. In a similar way there are cooler and distant forms of prosocialness, like charity and tolerance. Hotter forms of prosocialness are social justice, solidarity and advocacy. 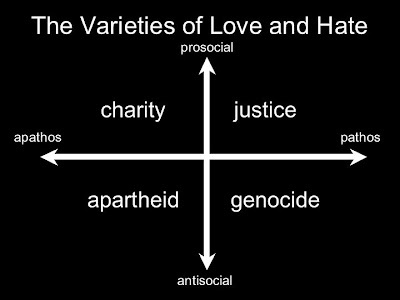 One of the points I was making in the last post was that the reason I thought that the "apathy is the opposite of love" formulation became so dominant was that preachers generally found their churches in the "charity quadrant." The congregations loved, but coolly and distantly. Thus, to call them to greater love the only move to make is to work the apathy dimension, moving a cool love into a more passionate engagement with the world. As you can see, I replace prosocial with embrace and antisocial with exclusion. I reframe the horizontal dimension as active versus passive. Consequently, we see Volf's discussion of abandonment as a form, a passive form, of exclusion (Volf makes this point). And, as Volf also notes, a more active form of exclusion is elimination (e.g., genocide). We find the words "contract" versus "covenant" in the top two quadrants. Again, these are Volf's terms. Contract here is the agreed upon social contracts that govern peaceable human community. Volf notes that this is a form of embrace, but that it falls well short of what God calls us to. Love is more than living civilly, although that is a necessary prerequisite. Thus, Volf calls the church away from framing her relationships with the Other through politics and social agreements. Replacing contract should be covenant, the loving and passionate engagement (hesed) that God models for us as he remains faithful to His people. You're too much. While simplistic systematizations like this are usually wrong to some degree I LOVE them! They really help organize one's thoughts. Well done. First impressions from a psychological and theological layman: in your first graph, I think the term "charity" is a weak choice. Remember in the old KJV, the archaic term "charity" was often used interchangeably with "love." Too, I think you can give someone Justice without loving them. In this regard, Justice is more akin to Civil Rights, as mentioned near the end. How about Justice in the upper left, and Mercy in the upper right? Richard - I echo aric. I love this stuff. I really liked the shared prosocial directionality of love and justice. I’m not getting the directional polarization of pathos and a-pathos. I get the idea of temperature here. A nice touch. But, are you saying that both temperatures are equally catastrophic (Thom)? – that both the move to a higher dimensional chaos of heated emotion, as well as the move to a frozen helium singularity of near non-emotion - both, as equally destructive? -- or, what? A quibble; but, fun. On your contract-covenant, I would merge both of these two into one (but, I see your reasons), and, then, in the vacated quadrant after that merger, I would posit “implicit” standards of care, in contrast to “explicit” covenantal-contractual expressions, much like our “common law” of torts (care), or like child development studies on right/wrong prior to knowledge of express, explicit rules – suggest we do eisegesis on implicit/innate canons on our justice scales. 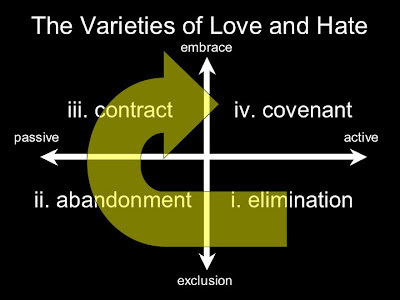 The contrast being: implicit v. explicit, or express v. implied, or innate v. agreed – because I do agree with you that higher forms of love integrate agreement-covenant. I love model building. But it is risky for its oversimplifications. Also, I think it is important to manipulate ideas for the sake of memory, understanding, and creativity. I like those suggestions. As a clarification I was using "charity" for "alms." Regarding pathos and the "temperature" metaphor I'd say that human passion isn't necessarily good or bad. It depends on its telos, the goal it is connected with. I do like you implicit/explicit distinction. I was struck by your description of this, and how the fourth dimension tends to be lacking in the research (and in behavior). For example, I am in the midst of a building a behavioral model of negotiation, and we ran a few experiments using an experimental design. In that design, we used a decomposed prisoner's dilemma game (where the person selects how much money in a pie they get, and how much the referrant gest). They then do 12 times at various total pie amounts... with three potential options of how to divide up the pie. These options are cooperative (maximize our joint gain) competitive (maximize my relative gain) or individualistic (maximize my gain at the expense of others). Based on their 12 divisions, they are categozied as one of those SVOs. It seems what is missing in this is some altruistic where I maximize your gain regardless of mine. There is an argument in the literature why it doesn't exist is that it fails to show up... perhaps sign of us not reaching your 4th square.